Summary Expandable two bay, high-performance BYOD SATA NAS with many features based on a dual-core Intel Atom D2700 processor. 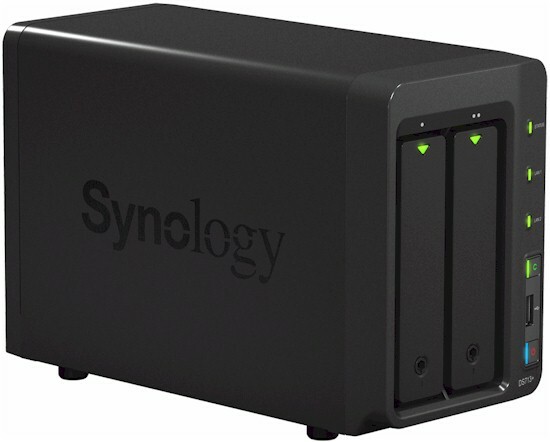 Synology recently updated its two-bay expandable small-biz NAS to create the DS713+. Besides transitioning from white to black, the DS713+ adds some new features, gets a faster processor, USB 3.0 ports and is optimized for simultaneous surveillance of up to 20 HD cameras. The DS713+ front and rear panel callout diagram below shows the two aggregatable Gigabit LAN ports, one USB 2.0 port, two USB 3.0 ports and one eSATA port. The front-mounted USB port is 2.0, while the two USB 3.0 ports are on the rear. Note that there are neither VGA nor HDMI ports for output to display. If you want to log into the Linux console, you'll need to enable SSH or Telnet and access the console that way. There also is no alpha-numeric status display to easily check the NAS' IP address. But if the NAS is on a network with an internet connection, typing find.synology.com will get you connected. The Synology main board is rather easy to remove. You can see it here, removed from the enclosure. Under the heatsinks you can find the Atom D2700 processor and its Southbridge companion chipset. Even though the RAM comes on a 1 GB SoDIMM, you can see that Synology doesn't want you messing with it...or at least the bar code sticker on it. The two connections on the bottom left are where the SATA backplane and rear USB connections tie in. You can see the Etron Tech EJ168A USB 3.0 chipset in the image of the daughter boards below. All the SATA controllers appear to be on the main board vs. mounted on the backplane like QNAP does. The key components for the DS713+ and, for comparison, the DS1813+ reveiwed a month ago and DS1512+ reviewed last June are summarized in the table below. We used two WD RE4 2 TB (WD2003FYYS) drives that came with the sample for testing. Power consumption measured 36 W with the two drives spun up. With the drives spundown power consumption measured 17 W. Noise of the NAS is classified as low and would be fine for a home office.